March 17, 2014 March 29, 2014 I Am Not A NumberLeave a Comment on Tolpuddle Festival Film Reviewed in Guardian – The zeitgeist is with us! Tolpuddle Festival Film Reviewed in Guardian – The zeitgeist is with us! The zeitgeist is with us! On the weekend of the launch of The Tolpuddle Radical Film Festival, entirely coincidentally there was a celebratory article by Sukhdev Sandhu in Saturday’s Guardian Review about The Salt Of The Earth, the Saturday morning film at this years inaugural Tolpuddle Radical Film Festival. Demonised and hounded off screen on its release, Salt of the Earth, released in almost impossible circumstances 60 years ago, has a strong claim to being the most ambitious American film ever made. According to its director Herbert J Biberman and screenwriter Michael Wilson, it was the “first feature film ever made in [the US] of labour, by labour, and for labour”. More than that, it was “a film that does not tolerate minorities but celebrates their greatness”. Biberman, Wilson and producer Paul Jarrico had all been exiled from Hollywood for their politics. Biberman had worked in theatres in Moscow and co-founded the Hollywood Anti-Nazi League before being jailed for six months for refusing to testify before the House Committee on Un-American Activities; Jarrico believed that Marx “had a lot to contribute to an understanding of society and history”. Forming the Independent Productions Corporation with other blacklistees, and eager to tell “stories drawn from the living experience of people long ignored in Hollywood – the working men and women of America”, they headed to New Mexico to make a film based on a recent strike by Chicano labourers against the Empire Zinc Company. There they teamed up with the International Union of Mine, Mill and Smelter Workers that, on account of its radicalism, had recently been kicked out of the American equivalent of the TUC. Their film featured only five professional actors; the rest were locals. 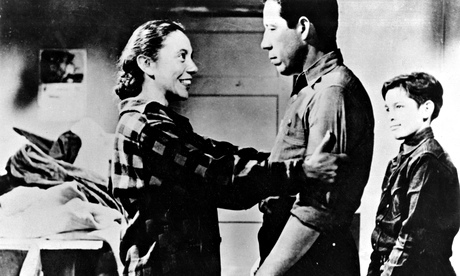 It focuses on Ramon Quintero (Juan Chacón), a strike organiser whose progressive beliefs don’t extend to the family home. Gradually his wife Esperanza (Rosaura Revueltas), pregnant with their third child, begins to assert herself, and becomes instrumental in encouraging other local women to join the picket line and fight the bullying tactics of factory bosses and corrupt police. Salt of the Earth has a powerful and often lyrical script, is shot in a style informed by Italian neorealism, and makes atmospheric use of New Mexico’s landscapes. It’s a rousing tribute to its subjects’ fight not only for economic parity with Anglo workers, but for racial justice and an acknowledgement, as Esperanza says, that “our roots go deep in this place, deeper than the pines, deeper than the mine shaft”. It also treated, uniquely for the time it was made, questions of race and class as inseparable from those of gender. This annoyed some union leaders, such as the Longshoremen’s Harry Bridges: “Why did you have to bring in the woman question? Why couldn’t you have made a straight film?” But later, in the 1970s, it would be praised by the feminist critic Ruth McCormick for its unrivalled attention to “the issue of women’s liberation – from the politics of housework to the myth of male supremacy”. Equally unusual is the emphasis the makers of Salt of the Earth placed on working collaboratively with the men and women they depicted. Wilson discussed his screenplay with around 400 locals at public meetings. They told him not to engage in “Hollywood shenanigans”, that they didn’t want to see stereotypical depictions of Mexican promiscuity and alcoholism, and that the enemy had to be portrayed “not so much as persons but as a force”. Soon however, a writer at the Hollywood Reporter began to raise a stink, claiming that the film was propaganda that endangered production at New Mexico’s zinc mines and, as a result, the US’s Korean war effort. The Californian politician Donald Jackson told Congress that the film was “a new weapon for Russia”, “deliberately designed to inflame racial hatreds and to depict the United States of America as the enemy of all coloured peoples”. Post-production was no easier. Laboratories refused to process the film. Editing was carried out in secret and at many venues, including, at one stage, the ladies room of an abandoned movie theatre in South Pasadena. Later, after Barton Hayes had quit as chief editor, it was revealed that he’d been in the pay of the FBI. None of the orchestra players who performed the film’s music were told the name of the project they were working on. Even when the film was finally completed only one LA newspaper ran ads for it, exhibitors were threatened with economic and physical reprisals if they booked it, and – in an especially bitter irony – the Projectionists Union refused to run it. Next “Why no films at Tolpuddle?” the huddled masses cry! Answer: This year there is!